At some point between Jane’s arrival at Chelsea and Anne Boleyn’s execution, Henry VIII wrote to Jane regarding some pamphlets which were being spread around London deriding their relationship. 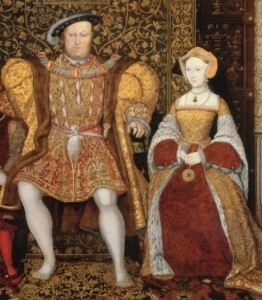 It is understandable that speculation and gossip were rife: the Queen was in the Tower awaiting trial and yet Henry VIII was having a relationship with Jane Seymour. As I have said before, the letter is nothing like the passionate love letters Henry wrote to Anne Boleyn while they were courting, but it may be that this letter was simply a quick, functional letter to put Jane’s mind at rest and that Henry sent Jane other, more romantic letters and they have got lost over time. He did include “a token of my true affection” with it. Halliwell-Phillipps, James Orchard. Letters of the Kings of England, Volume 1, 353. I believe that while Henry was very much attracted to Jane, he was never in love with her as he was Anne. After Anne, it seems he was forever guarded with his later wives. Jane seems only elevated to mythical status only after producing the much anticipated male heir Henry longed for. Having passed so soon after the birth and not being with Henry long enough to cause him any displeasure she then remained forever, “perfect” in his eyes. Sadly, I don’t really feel he expressed those types of feeling towards her while in life or at least not to that level. I think it was the conclusion of their story that creates this love story that people tend to believe in now. Anne and Henry’s history remains alive in writing and for that there is no doubt. Whoever wrote that ballad needs a medal. Ha! That’s hilarious, louise! So true! I wonder…was the author ever discovered? A most interesting document. I would love to read the pamphlet is refers to. Has it ever been found? Just found this page yesterday and can not stop reading it. Thank you. Blessed Be. I have to agree this letter is nothing like the ones sent to Anne. I think Jane was just seen as being a good candidate for producing a son and heir, and though tragic, by dying did stay perfect as Jenn said above. He was extremely happy and grateful to have the longed-for son, and she never gave him any trouble or scandal because she died. I assume he’s buried with her because of the heir that she bore him? I just don’t get the feeling though, that he truly loved her like he did Anne, or even in the beginning, Katherine. Perhaps the “love token” was a coupon redeemable for a one-time use of a really good French swordsman? Not that Jane needed it, of course. I agree that her death in childbirth elevated her to sainthood in H8’s eyes. I think she would have bored him to tears eventually but then she might have been the type to turn a blind eye to H8 taking on other mistresses. So many “what ifs” in history! I don’t suppose there is any of these ribald writings left to see is there, be great to read them, did they catch anyone for them? Henry never did like writing though, did he, to tell you the truth I’m surprized he didn’t get some one to write it for him. The letter does seem a little more business like in comparison to those he wrote to Anne, but although I think he really had a great affection for Jane, she didn’t evoke a great passion or love in him as Anne did, that was a one off. Maybe he didn’t want to remember those feelings any more, they embittered him now. Passionate only for Sons, it was all about Henry, Heirs, and an obedient acceptable wife and Queen. Here’s my ‘child-like’ attempt at a Tudor Tavern bawdy ditty, if there isn’t any left from the time about him and his new Queen to be, hope I haven’t embarrassed myself 🙂 ….knock it off if it’s toooo daft Claire, might help if everyone got drunk before they read it, things always seem funnier then don’t they ! A Wifing he will go. A siring he will go..
absolutely great ,you have a talent for this ,would love to hear more. You must have found the original ballad in your attic! 😉 A great effort! It is a shame that it no longer exists and I’d love to know whether it was spread around by Boleyn supporters or just a troublemaker. I laugh aloud hahaha! Really fun! Dawn, if I send you my PayPal address, will you please send money for the monitor that is now dripping with the drink that just came shooting out my nose? The ditty made me chuckle. I like it. No. The letter is nothing like the “seventeen” he wrote to Anne. It had been the opposite in contrast. There is this letter that Henry wrote to Jane and there is one that Jane had written to him but at a later date during the birth of Edward which was only found as well as discovered last year alongside another letter at the same time but was due to battling with the scots which happened a few years later. I too would like very much to see the ballad. I wonder if a copy is in some as-yet-uncatalogued archive somewhere? Though my guess is that it wasn’t actually printed in the first place; who would dare? The letter isn’t like the ones to Anne (well, the end is a little bit — “hoping shortly to receive you in these arms” etc) but of course he knew he was going to see Jane very soon. Anne’s letters seem to have been sent when they were separated for a longer period than a couple of days. I honestly believe Henry loved Anne more than any of his wives. He fell in love with that fire of hers and if she would have just behaved like Jane did when she married Henry, then maybe Henry would have given it more time. He wasn’t with Jane long enough to truly love her, and she probably didnt really love him, but married him because of her family. Anne started out that way, but she wanted everything she was supposed to get when she married henry but her struggle was very much harder than any of the other wives, because of Catherine of Aragon. Some say that love can’t be measured or compared. And that with time the love ‘grow’s up’. But Jane lovers may excuse me, because in this case; yes it can be compared. We can observe how differently he have acted with Anne(before) and his cousin Chaterine Howard ( After Jane). How passionate and lovely he was. “No more to you at this present, mine own darling, for lack of time, but that I would you were in mine arms, or I in yours, for I think it long since I kissed you. And then he was melting for Howard calling her ” a rose”. Nothing in this world ( except if we find better letters in the future ) may convince me about this ‘love’ for Jane. Bit late to this comment – but Dawn, that ditty is inspired – funny and wry. You have a nimble and clever mind!